Spanish trading volumes are believed to be performing well on the thought of a recovering economy. The once recession-hit nation’s main equities trading venue reported strong data for the month of November. Overall figures were upbeat with particular growth seen in the equities and ETF segments. The venue reported that trading activity in its equities division was up 25% on the year. These figures were supported by strong metrics in its ETF product range; The basket instruments saw trading volume up to the end of November grow 131% from the same period in 2013. However, volumes weren’t as vibrant in the derivatives segment; Trading volume rose only 3.8% in the first 11 months of 2014. The exchange’s official data stated that equity trading volume on the Spanish Stock Exchange in November, alone, came in at $117 billion, 40% higher than figures reported in the same month in 2013. Across the ETF segment, the trading volume up to the end of November came in at $11.1 billion, up 131% from the same period a year earlier. In November, itself, the trading volume was $1.05 billion, up 75% from November 2013. The number of ETF trades up to the end of November totalled 102,693, up 72% from the same period in 2013. In just November, there were 9,704 trades, up 91% year-on-year. 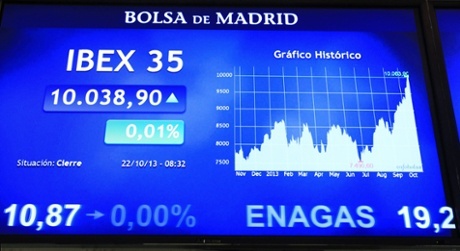 Futures trading in the futures and options segments was driven by sharp moves in the Ibex, the main benchmark index. The benchmark gauge of Spain’s largest blue chip companies has been trading range bound, but a dip below the formidable 10,000 mark in October triggered sellers entering the market in a bid to further push the index to key support levels. Nonetheless, the market recovered during a busy November. Trading volumes in derivatives linked to indices saw 592,342 contracts trade on the IBEX35 Futures and 269,765 on the IBEX Mini Futures, with respective year-on-year increases of 10% and 36%. Trading activity also rose in the open interest segment; The venue saw a sharp 5% rise in the open interest of IBEX 35 Futures to 84,651 contracts. Spain’s financial markets have seen a U-turn in the number of transactions passing through its systems in 2014. The move comes four years after one of the worst economic conditions the country has seen. At that time, the south-European nation saw its unemployment rate surpass European peers, and in the latter months of 2012, the country’s unemployment rate continued to hit fresh lows, reaching 26%, with 5.97 million Spaniards out of work. The figure was a bigger concern for Spain’s young people. The 16-to-24-year-old age group saw unemployment hit 55%. Spain’s recent turnaround saw the economy surpass its European neighbours in terms of economic growth in November, which touched 0.5%. Spaniards have been saving their cents over the last four years and finally the cookie has stopped crumbling, with consumption driving growth in the economy.